The Doulton marks are many and varied but most follow the same theme. Dating Royal Doulton products from their Doulton marks means you sometimes have to check very carefully. 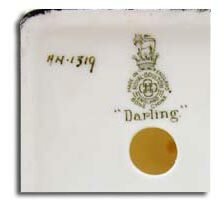 Factors other than the Doulton mark can help in more accurate dating, particularly pattern names and numbers and date codes or artists monograms. 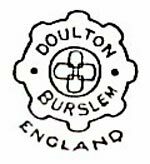 Between 1878 and 1882, Henry and James Doulton acquired a major interest in the Pinder Bourne factory in Nile Street, Burlsem and changed the name to Doulton & Company, Burlsem. Doulton continued, intially, to use the base marks of PINDER BOURNE & CO and/or the initials P.B. & CO or P.B. 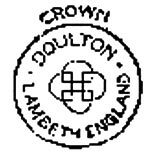 Several other Doulton marks occur in the very early stages and incorporate pattern names such as ROUEN and KEW, with some remaining in use for up to twenty years. The following tables contain a selection of the most commonly used BURSLEM and LAMBETH ware marks. Together with some additional hints that may help with dating your Doulton pottery, porcelain and stoneware. Early printed or impressed marks using pattern names. Rouen and Kew in the examples at left. ENGLAND added after 1891.Coronet added after 1886. Adapted from an early Lambeth mark. Incorporates the interlocking ‘D’ motif. Coronet added to mark the appoinment of Henry Doulton as Potter to HRH The Prince of Wales. Adaptation of the coronet mark. Used on Holbein wares. Occasionally found between 1903 and 1915 together with standard print mark. Several variations found on Chine Wares. Sometimes with the words CHINE WARE. Introduced to mark the grant of the Royal Warrant by King Edward VII. Small items only marked with the cicular section of the mark. No lion or crown. Commonly in use after 1932 but sometimes seen btween 1928 and 1931. 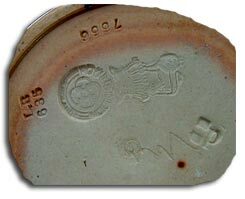 This mark is still used on fine earthenware products such as character jugs.. The same as the standard print mark but with the addition of BONE CHINA below the mark. Can also have FINE BONE CHINA or ENGLISH TRANSLUCENT CHINA. Introduced in 1973-74 to recognise the newly named FINE ENGLISH CHINA and stiil used today. Early impressed moulded or incised marks on stone ware and terracotta products. Impressed or print mark with several variations. Used on plain brown and cream glazed stoneware and occasional faience ware. Impressed mark on early Doulton Ware. The date of production was added to the centre after 1872. A circular printed variation can also be found. Impressed or printed mark on Lambeth Faience wares. Impressed mark usually with the year of production incised into the clay. Impressed mark found on stoneware. From 1872 the year of production should be impressed and there should also be an artists mark. Impressed mark on special items. Impressed or printed mark on special Marqueterie wares. Impressed mark on Doulton silicon wares. Impressed mark on Carrara wares. Standard impressed mark used 1902 to 1914 and 1927 to 1936. In 1902 to 1914 an impressed shield is also present which includes a lower case letter. c=1902 – d=1903 – e=1904 up to o=1914. Variation of standard impressed mark without the crown. Variations occur particulalry without the outer ring. 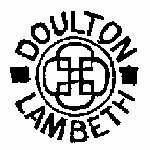 Throughout their history Royal Doulton introduced various special marks relating to specific collections or specific ranges of wares. A special mark used together with the standard Burlsem mark on Morrisian wares. A special Doulton mark for small titanian wares. Larger wares have the standard mark with TITANIAN printed underneath. Found on Doulton Brangwyn wares either on its own or with the standard mark. Printed mark which appears on early Flambe wares, particularly smaller items. Variations occur with the standard Doulton mark and FLAMBE underneath. Sung script mark used with Flambe mark. Sometimes signed by Charles Noke and with artists monogram underneath the standard mark as left. Chang script mark used with standard Doulton mark. This example signed by Charles Noke and with artist Harry Nixons monogram. Special Royal Doulton series ware mark, produced specifically for that series ware. There are many others including Home Waters and The Gallant Fishers as the mark on the right shows. Special Royal Doulton series ware mark, produced specifically for that series ware. There are many others including Home Waters and Under The Greenwood Tree, as the mark on the left shows. 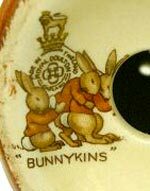 Doulton produced a special mark for the bunnykins range of nursery ware. There is an old rule of thumb for dating Doulton figurines; where you add 27 to the small and hardly visable number to the right of the Doulton backstamp. The following numbers indicate the approximate date range or period when the marked item was first introduced. That is not to say that your item was produced in that year but simply that the year indicated is the earliest the piece could have been produced. Robert Allen and artists in his studio were often allocated RA-numbers for their hand-painted wares designed and decorated by them. The RA numbers are mostly hand-written and accompany the standard Doulton marks. Robert Allen handpainted wares were never produced in large quantities and many were never repeated. The dates given below give a close approximation of when the designs were produced. RA-1 is repeated twice and it should be noted that the re-setting of the number marries up with the new Doulton lion and crown mark. Royal Doulton Marks …. 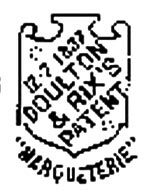 are many and varied as Doulton marked their wares from the very start. 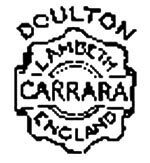 The extensive range of Doulton products meant a reasonably complex set of marks and way of marking was required.